On June 30th, 1970, the US national debt load sat at around $370.1 billion. On September 30th, 2009, the US national debt load had shot up to around $11.9 trillion. The average rate of inflation in the United States since 1970 has been about 4.55%. From 1970 to 2009, the US national debt has grown at a pace of 9.27% per year, more than twice the rate of inflation. The worst year for inflation during that time was 1980, when the average rate of inflation in the United States (over a 12 month period) was 13.5%. The US national debt grew by about 9.8% that year. 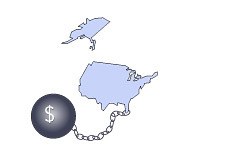 In 2009, the US national debt load grew by 18.7%. According to the US government, there was actually deflation to the tune of 0.4%. The worst year for the United States from 1970 to 2009 in terms of a jump in the debt load as a %? That would be 1980, when the debt load soared over 20% (20.5% to be exact) over the course of just 12 months. The United States was trying to resurrect their economy after a period of ruinous stagflation (high inflation plus weak economic activity) during that time. The best year in terms of the smallest debt increase? 2000, when the debt load of the United States increased by a miniscule (comparatively speaking) 0.3%. As you can clearly see, the only period in which the United States seems to have had their debt under control was 1996 to 2001. That period of economic prosperity (the United States was actually posting budget surpluses back then, gasp) was book-ended by long periods of extremely high national debt growth. -if the United States had managed to contain their national debt growth to the rate of inflation over the past 40 years, then they would have owed just $2.2 trillion at the end of the 2009 fiscal year, rather than $11.9 trillion. -if the United States continues to grow their debt at the same rate for the next 40 years as the previous 40, then the country will owe approximately $400 TRILLION by the year 2048. Now, this is obviously a laughably high number, but it just illustrates how fast the US national debt load has grown since 1970.